Erica Goss is a talented poet, whose Wild Place poetry collection I loved (my review) and who was the Poet Laureate for Los Gatos 2013-14, has offered up her talents today as a reviewer. She also has a new book, Vibrant Words: Ideas and Inspirations for Poets, that was published in March this year. 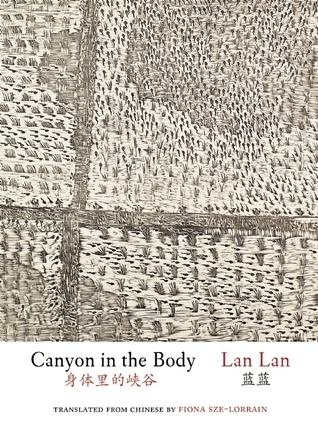 Today, she’ll be reviewing Canyon in the Body by Lan Lan, translated by Fiona Sze-Lorrain (Zephyr Press, 2014, USA). “Lan Lan is considered one of today’s most influential Chinese lyrical poets. Her work has been translated into 10 languages. She is much-awarded in China, and appears often at international poetry festivals. Canyon in the Body is her first book to appear in English,” says Goss. In her speech at the 2013 National Book Awards ceremony, Mary Szybist stated “There’s plenty that poetry cannot do, but the miracle, of course, is how much it can do, how much it does do. So often I think I know myself, only to discover in a poem a difference, an otherness that resonates, where I find myself, as Wallace Stevens once put it, ‘more truly and more strange.’” The poems in Canyon in the Body create an environment where we also find ourselves “more truly and more strange,” an experience that only a certain type of poetry delivers. Lan Lan accomplishes this as much by what she leaves out as by what she includes. Her poems invite the reader into a series of microscopic moments, honed and spare, yet resonant with layers of meaning. Her diction seems direct, even simple, but simmering in that simple language is a spirit of rebellion, even violence. The door is shut for you to pass. The speaker’s “loosened hand” holds tight, while a closed door invites passage. She successfully captures the transition between dream and consciousness, intertwining opposing ideas instead of contrasting them. She uses this technique often and with skill throughout the book. The reader enters the instant in the poem, the flash of power from the mountain juxtaposed with the vulnerability of the scarred tree trunk, ending with a human being engaged in memory or dream. The repetition of “eyes” and “mountain chains” intensifies the affect. Lan Lan’s poems are not what they seem at first, and resist attempts to explain or paraphrase. They are pared down to a separation of essentials, with the reader needing to make leaps of understanding or meaning within the poem’s structure. There are chasms between these lines, deep spaces of potential. Fiona Sze-Lorrain, the collection’s translator, leaves those chasms intact, moving with deft confidence from line to line and poem to poem. She is our able guide in the strange, intriguing world of these poems. have I died once more? A lethal thorn of autumn wind pricks my chest. Thanks, Erica, for sharing your thoughts on this collection. I wonder too about these poems and that otherness; it is as if Lan Lan is asking readers to jump — jump into that otherness! Sharp and tough. I am reading a collection right now that is sharp but humorous. I forget the title but it’s got “end of the world” in there. I think I won it from you! OH, was that from one of the Cohen brothers? It is humorous and sharp! Wow, sounds like a great book that you definitely have to commit to spending some time with given the numerous layers. Thank you Serena and Erica! This is a wonderful post. These poems hold so many treasures. It sounds fantastic, doesn’t it. I have to get my hands on a copy of this one. I’m thinking the same thing, Serena! Lan Lan’s poems are beautiful and strange, deeply felt and spare. I will return to her book over and over. I’m eager to add Lan Lan’s poetry to my shelves! Erica, I also added the Sept. video poem link to this post. Thank you, Serena. Always a pleasure to be included here!